On the surface an article about Disney’s PotC ride being given a holiday makeover. OK fine. But keep reading and you’ll learn of plans for characters from OTHER films being intermingled amongst the pirates, Miley Cyrus replacing “the Redhead”, and the ability to “shop” while you ride the ride by pointing a telescope at merchandise tucked amongst the scenery and clicking a “charge me now” button. And you thought George Lucas had a knack for violating your inner child. It seems he’s a saint next to the mouse. There’s a chance this is all a joke, but Disney has hardly earned my benefit of the doubt in such matters. You better not pout – MiceAge.com. Curses to Scarlett Harlott, who made me aware of this article and thus depriving me of sleep for the next week or two. 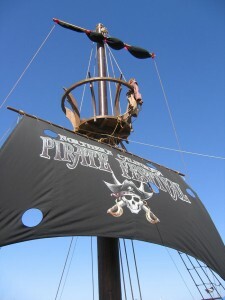 Avast: Pirate Chic Returns – BlackBook. There’s a right way to do pirate fashion, and there’s a wrong way. Wanna guess which one Vivienne Westwood chose? The wrong way – definitely the wrong way. 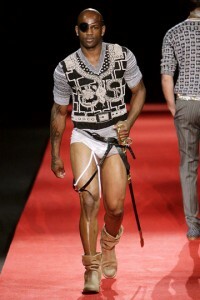 But now that I think on it, most ways I’ve seen on the runways have been the wrong way. Jean Paul Gaultier back in 2007 had a mixed bag, and Gwen Stefani with her Rich Girl video struck several high points, but most of the stuff out there has been sorely misguided – and that goes double for mens’ wear. Why, oh why does no one design awesome modern clothing for the heterosexual, non-demented guy pirate? The answer, of course, is that straight, sane guy pirates pay no attention to fashion whatsoever, and buy most of their modern clothing at yard sales and side-show gift shops.